These are all in storage currently. Mom has retired from weaving. 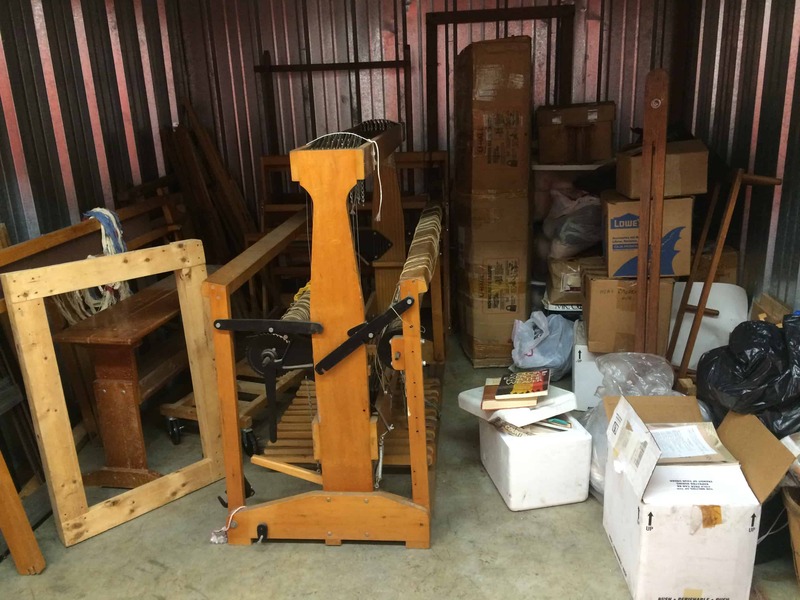 There is a 10×12 Macomber 48″, a 36″ Harrisville, and a mystery loom in a wardrobe box that was purchased but not opened or used. There are many additional items and instructional books and magazines concerning the craft. There is also a number of bags containing spools of various types and colors of thread used for weaving. The plan is to get it all gone at once to someone interested in weaving as a life style. I will consider a reasonable offer, but the asking price has been reduced to $1,500.00 Thank you for your consideration. I wasn’t looking for any other non-portable looms. I haven’t even used the floor loom I already have — it’s been sitting in my dining room since February, looking forlorn! I don’t have space in my house for 3 more looms either. But if I wanted a brand new Macomber, the same style mentioned would cost almost $6000. A new Harrisville of that size is $2500 or so. I could keep two of the four (counting the one I have) looms and sell the other two, perhaps recouping most or all the cost of the entire storage unit. So I e-mailed the seller. How long have the looms been in storage? Are they operational? Answers: 5 years. Yes, I think so, though an ex-friend cut the cords on the Harrisville. And so I went ahead. I asked about sizes of things so I could figure out the right size truck to rent. 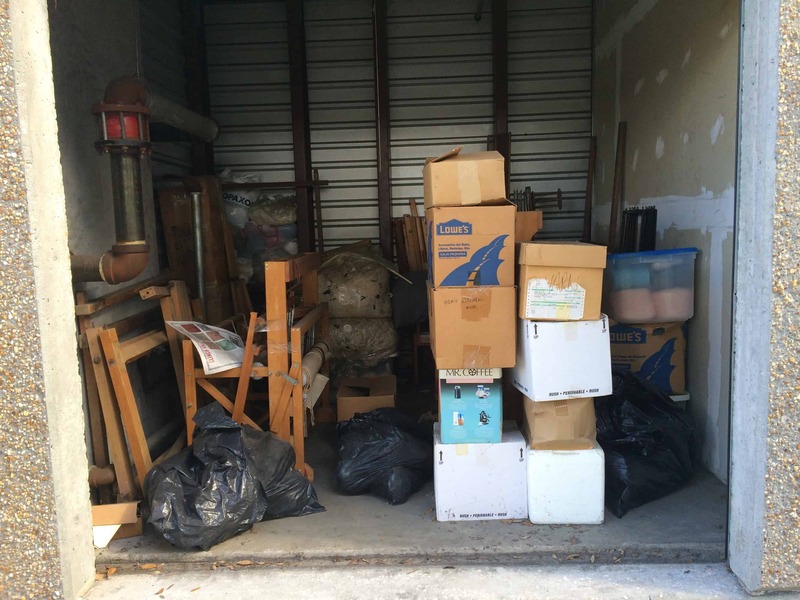 I arranged for a 9′ Uhaul cargo van and a climate controlled storage unit. I asked a friend to make the 2 hour trip to Tampa and back with me to help me retrieve the looms. And yesterday, I set out on the epic adventure. It started a little bumpy. My friend arrived at the UHaul just after I did, but she was clearly sick. I told her to go home and rest and called my father. A couple of days before, he’d volunteered to go with me, but I’d already asked my friend. He said he could still go, and I’m so glad he came! He’s an excellent packer and I don’t think we would have fit everything in the truck if he wasn’t there! The Uhaul was out of keys to the exterior building of the door where my unit is. The manager ran to Lowe’s to get keys made while another employee worked through all the paperwork with me and showed me the unit. I still had to wait an additional 10 minutes for the manager to get back; I wasn’t sure I’d be back before they closed for the day and I needed to be sure we could get into the unit. 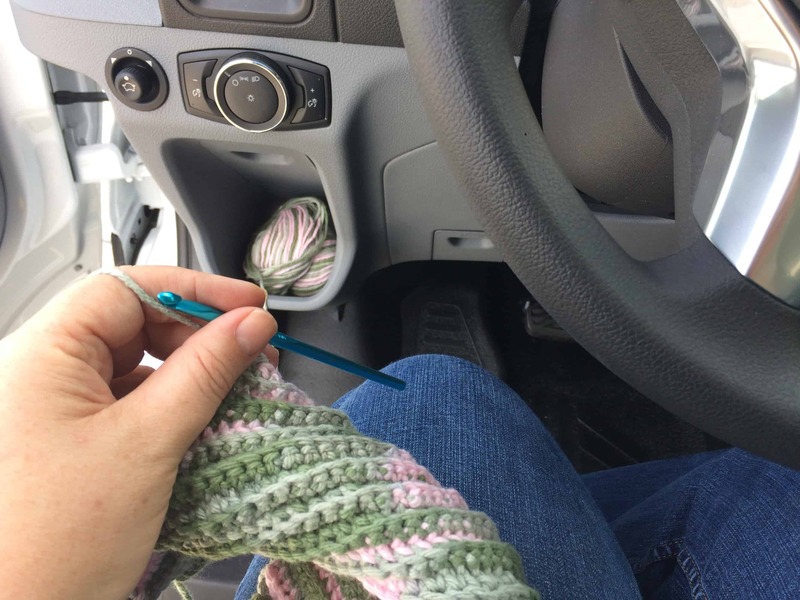 Of course, I sat in the Uhaul van and crocheted while I waited. In fact, there was another loom in there that the seller didn’t know about. See those pieces on the left hand side, just under the pipes? That’s another loom. It’s a 4-shaft, 4-treadle counterbalance loom with about a 30″ weaving width. I think all the pieces are there, but it looks like it has some damage to the wood and I’m not sure if it will be salvageable. The bags you see in the picture are mostly full of yarn. Some of the boxes hold yarn, but most of them are weaving and spinning magazines and books. I’ve only taken a quick look through them, but there’s only one or two books that I already own and several out-of-print books that were on my wish list. You can’t see the tapestry loom, the basket full of various types of shuttles, the 3 warping boards, an umbrella swift, and few miscellaneous pieces of equipment whose function remains a mystery to me. We packed everything into the van and headed back home. My husband met us at our storage unit and helped us unpack. As we put things into the new storage unit, I decided to throw out some of the rug yarn (those big bags of white stuff in the back of the picture above). The bags were fragile. They split — or may have been chewed by rodents. I didn’t want to take a chance, so it went straight to the trash. Now I have a storage unit of my own. Over the next few weeks, I’ll be cleaning and sorting. I’m sure more will be thrown away. Some things will come home with me. Some will be sold or donated or gifted. I’ll keep you posted on my progress! Wow! That’s a lot of weaving supplies. I hope it all complements rather than duplicates what you already have. I will second that your father is an excellent packer. I never knew all my books could fit into so few boxes. What a haul–in more ways than one! What a wonderful collection of things, including the books. What treasures did you find? And what a great dad! To get myself moving, I hereby challenge you to put a warp on and weave off something on a multi-harness loom by March 1 2016, and I challenge myself to add the heddles to my Harrisville, warp it for some towels and weave it off by March 1 2016 (perhaps the towel kit I received as a Christmas gift two years ago that I don’t have enuf heddles for until I add them). The shame of losing the challenge may actually motivate me to clear the space in front of the Harrisville! Although I expect you are likely to warp ALL your multi-harness looms…. And do a more complicated pattern, and have nicer selvedges.